They made it! 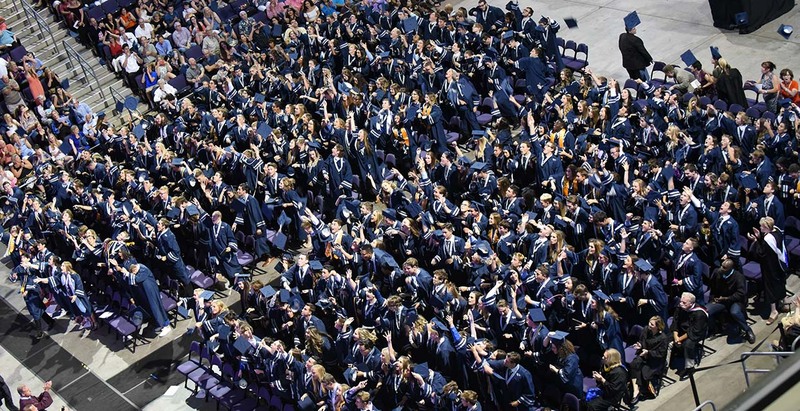 Graduation caps were exhultantly tossed high, as the Class of 2017 celebrated crossing their Cactus Shadows finish line! GRAND CANYON UNIVERSITY – May 25. If 403 graduating high school seniors nationwide were to be randomly polled, how many would correctly identify the historical significance of 1917? When American History was the respected core subject in high school curricula, students learned that 1917 marked the entrance of the United States into World War I, which (then) President Woodrow Wilson, an avowed pacifist, would herald as “the war to end all wars” and the one that “would make the world safe for democracy.” Only 24 years later, Japan would devastate Pearl Harbor. So much for history. “Falcon Pride” – family style. Gabriella Gianni, four years a Student Council member, with Creeker parents Gaetano & Danica Gianni, both CSHS teachers and veteran team coaches. Now, 100 years later, fast forward to the evening of May 25, 2017, when 403 Cactus Shadow Seniors made local history of their own by jubilantly graduating high school. For the third consecutive year, CSHS Commencement was held in audience-comfortable Grand Canyon University Arena. 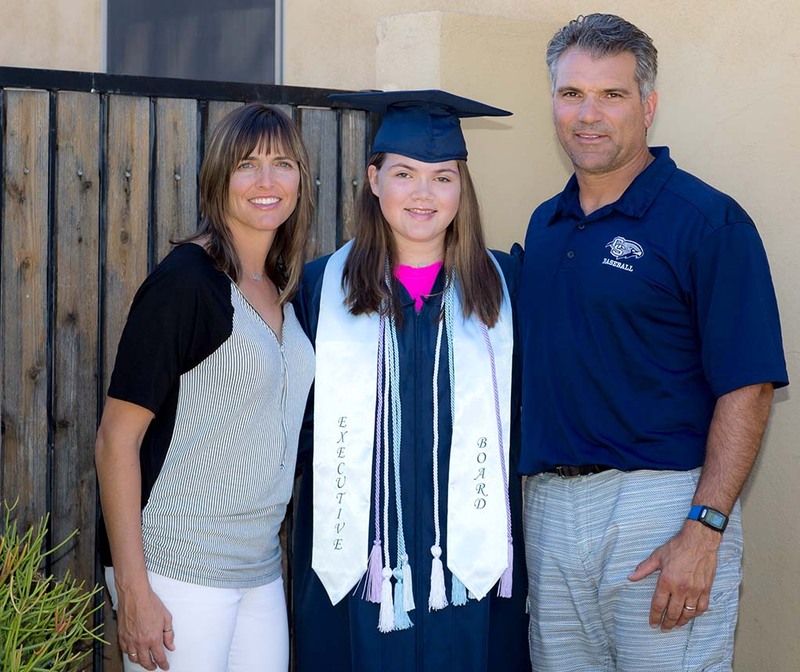 It was Cactus Shadows 32nd graduation. At Senior Awards Night, May 22, Dr. Bebee had proudly announced that Class of ‘17 members had earned $13,217,176 in scholarships and financial aid. In making his announcement, Dr. Bebee praised and congratulated the Class scholars. Sonoran News congratulates the awards recipients – and the CSHS faculty members who encouraged their students and supported their applications. Four spoke for ‘17! 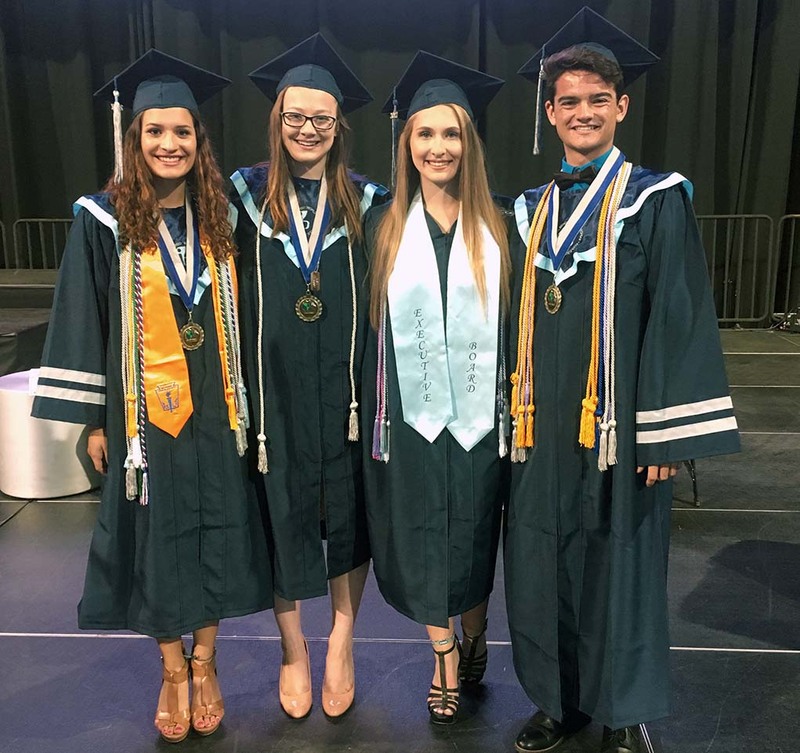 Featured speakers at May 25 graduation were Salutatorians Laila Elias (Marianne and Mike Elias), Kali Draper (Lisa and Ronny Draper), Student body president Lauren Busbee (Janet and Rick Busbee), Valedictorian Kameron Moore (Karla and Grady Moore). In addition to congratulations and good wishes, this writer would exhort the Class to keep always fresh your memories of this commencement evening. Remember, young folk, you graduate high school only once! This writer thanks Dr. Burdick, Dr. Bebee, Mrs. Julia Scotto, Mrs. Candy Jones and photographers Gina Brown, Scott Nemetz and Cameron Bender for their contributions to this article.